It’s not as simple as knowing that such-and-such street is a hot tourist location. These locations and the types of customers they draw can change not only throughout the day, but throughout the month and year. And what about popularity? Tourist locations can have dramatically different levels of popularity which would be insightful information worth mapping. But that’s a variable that’s challenging to measure. But what if widely used platforms like photo-sharing sites, Flickr or Picasa, could be used to aid in this kind of mapping? Discover Kiwi : A market mapping tool for Asia. One of the challenges data companies like getchee face when asked to create tourist intensity maps for businesses is an inability to be physically present in many locations at once to conduct on-site verification of our analysis. Even when we can make visits, our familiarity with the city will never surpass a locals’ and therefore faces certain limitations. That’s when we have to get creative with our analysis and this is a glimpse into how we do it. Last year a banking client of ours in Thailand sought to expand their ATM network with three target demographics in mind: their cardholders, their cardholders that were using competitor ATMs, and tourists. The meatiest piece of the pie is the tourist segment because they pay higher ATM transaction fees and therefore contribute much more to the bottom line. Knowing where tourists aggregate becomes a focal point. Mapping tourist locations at first glance can sound fairly straightforward, but many challenges quickly present themselves when trying to account for the complex transformations these locations may see throughout time. Key POI certainly includes the tourist places recommended by travel guides, fancy restaurants, local markets, malls, and hotels, and is a standard starting point. From there a clearer picture can then start to be shaped by adding additional layers to the predictive model by prioritizing places that are easily accessible via public transportation. See how getchee uses data to optimize store networks. It’s a fairly simple exercise to aggregate data from multiple sources but our specialty lies in building up the layers, mapping them out, and visually finding new meaning that wasn’t obvious before. In this case, finding the optimal areas for ATMs so they’re easily accessible to tourists. Having the ability to rank tourist hotspots by popularity would be a powerful layer to add to such a map, but something like popularity is still extremely hard to measure throughout a city in a valid way. But there are innovative new experiments taking place that could lead to compelling new methods. For example, I recently came across a brilliant piece of analysis by Eric Fischer that exemplifies a layer that can inform a predictive model for indicating which hotspots are more popular among tourists. 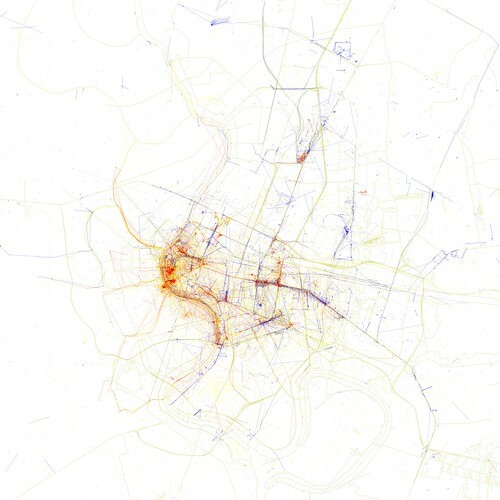 Below is a look at a tourist heatmap of Bangkok created by Erik from geotagged Flickr photos. The denser clumps indicate higher frequency of photos taken by tourists, and therefore the possibility of higher levels of popularity. He used the Flickr and Picasa search APIs to aggregate photos taken across a city and used the geotags to distribute where they were taken. Then he says, “The tourist vs. local distinction is based on the timestamps of the photos; if someone took pictures in the same city over the course of more than a month, they are considered local.” As we ply on the layers, we begin to see trends emerge. When the layers corroborate we can more comfortably make recommendations on optimal areas even though we’re sitting in Taipei, Taiwan. For businesses like banks or retailers having this kind of robust validation means they can make location decisions with a higher amount of confidence. As a data focused company, getchee is constantly keeping an eye on and experimenting with these new techniques that could lead to high value for our clients. « Should retailers still care about how many locations they have in China?